Recently I came across a chicken recipe that called for raspberry vinaigrette. Since I rarely purchase ready-made vinaigrette of any type or flavor, I bulked at the idea of buying a bottle just to make this dish. 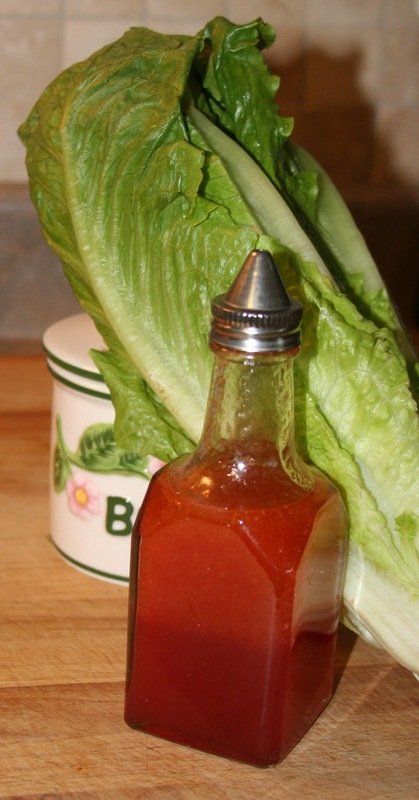 A number of reasons not to purchase vinaigrette, beyond having another bottle of something strange floating around your refrigerator door and that it is so easy to make, come to mind. If you read labels, which I do, you find water listed as the first ingredient in most processed vinaigrettes. Next comes various types oil and, in the case of raspberry vinaigrette, the list includes such things as corn syrup and sugar. Somewhere down the list of ingredients, you find raspberry juice concentrate and/or other artificial flavors. The lengthy list goes on with some items just as hard to pronounce as they are to invision, which makes one wonder why something that sounds so simple should be so complicated. I concluded that it should not and, since the raspberry bushes located in my back yard produced nicely last summer, meaning a large bag in my freezer, I had the resources. Even those without backyard bushes can find frozen raspberries at most supermarkets. I checked out a number of recipes for raspberry vinaigrette on the Internet and found most called for ingredients such as maple syrup, Dijon mustard, soy sauce and or various herbs that seemed flavor intrusive to me. Raspberries need no assistance in the flavor department, in my opinion, so I set out to make a simple refreshing vinaigrette that worked well in my recipe and doubled as a nice, lite but flavorful dressing for greens. 1. Place vinegar and raspberries in small saucepan and bring to boil. Remove from heat and allow to steep until completely cooled, approximately 30 minutes. 2. Strain vinegar through mesh strainer and press to remove seeds. 3. Whisk in oil and honey. Store in refrigerator. 1. Sprinkle the chicken pieces with pepper and set aside. 2. Heat oil in skillet over medium heat and sauté onion until golden, 8-10 minutes. Using a slotted spoon, remove caramelized onions from skillet, leaving any remaining oil and set aside. 3. Add chicken to skillet and sauté until no longer pink, 3-4 minutes. Remove from skillet and set aside with onions. 4. Add remaining ingredients to skillet and bring to boil. Cook, whisking constantly until sauce thickens, 2-3 minutes. 5. Return onion and chicken to skillet and continue cooking until heated through, 1-2 minutes. Serve over rice.